The most upsetting kind of game is not one that’s catastrophically awful, or aggressively mediocre, but rather one that should by the sum of its parts be an unmitigated wonder, only to fall short of its own promises due to flaws of its own making. A game that’s truly horrible is often hilarious; one that’s alright but feels like it could be better is saddening. You just end up wishing the pieces aligned a bit better, that there was a tad more forethought put into the design, that the devs had given it a little more time in the oven. 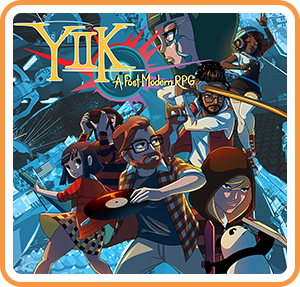 YIIK: A Postmodern RPG is, regrettably, illustrative of this paradoxical tragedy. 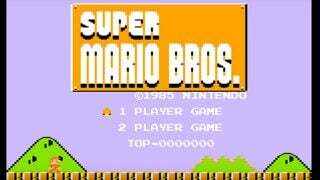 It is at once an indie game with a complex narrative, a refined aesthetic, and a unique verve on the conventions of video game storytelling, and also saddled with baffling design choices, slothish pacing, and technical issues that make the experience less of a ride and more of a struggle — like a delicious fruit covered with warts and going slightly rotten. And having to make that comparison breaks my heart a little. YIIK is the story of Alex, a recent college grad with a B.A. in Liberal Arts who’s returned to his hometown of Frankton with no real direction or purpose. By the circumstance of chasing after a cat with a Salvador Dali moustache, he happens upon a destitute and byzantine hotel inhabited by an odd woman named Sammy. Just as Alex gets to know her, she’s pulled from an elevator into bizarre, otherworldly space by creatures made of stars — setting off a story of mysticism, conspiracy theories, and the end of the world as we know it. 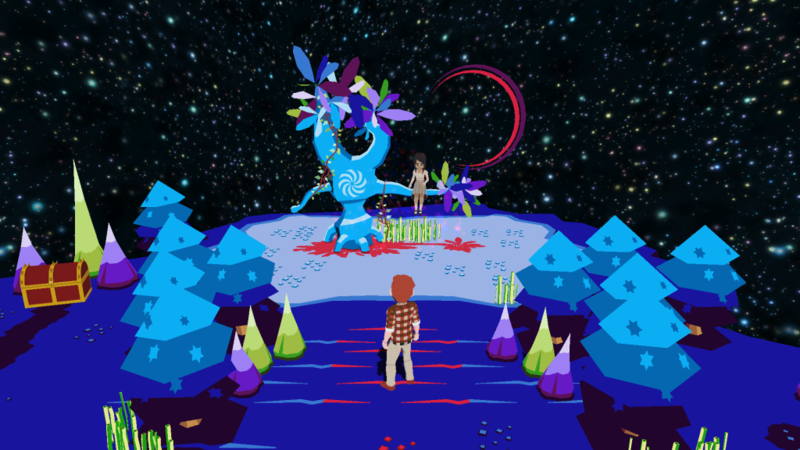 On paper, there’s a lot about YIIK’s narrative that excels. Most of the cast is mildly quirky and interesting, and there are plenty of funny one-liners or lighthearted moments that endear themselves. Alex as a protagonist is at times deeply unlikeable (in an intriguing way), both selfishly nearsighted and pretentiously occupied with his own situation, yet strangely relatable. There were moments when I saw bits of myself in him and that made me uncomfortable. Following his flawed foray through a world that grows increasingly bizarre and alien, there’s a lot of metaphor at play — becoming an “adult” when you’re unready for the task, not recognizing the world you grew up in, having your own destructive tendencies harm you and everyone around you — and as someone who recently exited university myself, I could resonate with a lot of it. But the writing in practice is a lot messier than it should be. Transitions between lines and scenes can sometimes feel thin or just outright missing. There are plot points and characters that appear to get some setup, but don’t really go anywhere. While Alex is definitely meant to be a flawed character, there are moments when it somehow feels like it’s both too critical of him and yet not critical enough, focusing on light moments of jerkishness that are told rather than shown instead of his more pervasive flaws (which, even then, he’s very cognizant of and tries to fix). It really feels like the script needed an editing pass or two, as while the core was strong, the lack of coherence in certain areas is felt throughout. Fortunately, the slack in the writing is picked up by something rather rare for an indie game — full voice acting. And this isn’t recorded in a basement on a shoestring budget with the devs’ friends — there are some absolutely stunning performances. Every voice fits each character like a glove, imbuing them with personality, passion, and an air of authenticity. While every VA does their job wonderfully, special mention must go to Chris Niosi as Alex, who travels through every range of confusion, indignation, and despair in his journey of grotesque discovery, perfectly punctuating the emotional beats as they come. While there’s the occasional smidge of overacting, in general the performances are nothing short of fantastic. 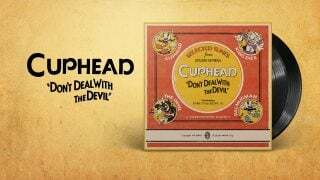 The game’s audio design in general is quite good — in fact, it’s probably the game’s strongest suit. Intentionally harkening back to the late ’90s, sound effects are glitchy and full of beep-boops in a way that feels retro but not overly cloying. The music, meanwhile, is varied and wondrous, fusing electro synths and hard rock to form a rainbow of sound, thanks in part to a large team of composers. It even has tracks by Hiroki Kikuta and Toby Fox! Tying into the rest of its quasi-vaporwave aesthetic, the game’s visuals are also on point, showcasing an urban environment of vivid colors and simple shapes that is reminiscent of Katamari Damacy, among others. There’s a shocking amount of detail in some locations, and the game also flexes a neat array of visual effects that look vaguely outdated in a way that just makes sense. Character designs are varied and expressive, striking a neat chord between anime and a more realistic style. Animations are a bit choppy and stilted, but instead of feeling distracting it just… works with the game’s atmosphere, providing a feeling of nostalgia for a visual style that technically never was really an era in the medium. So the game has a unique aesthetic and a foundational (if flawed) story… where does that leave the gameplay? Let’s start with some positives. 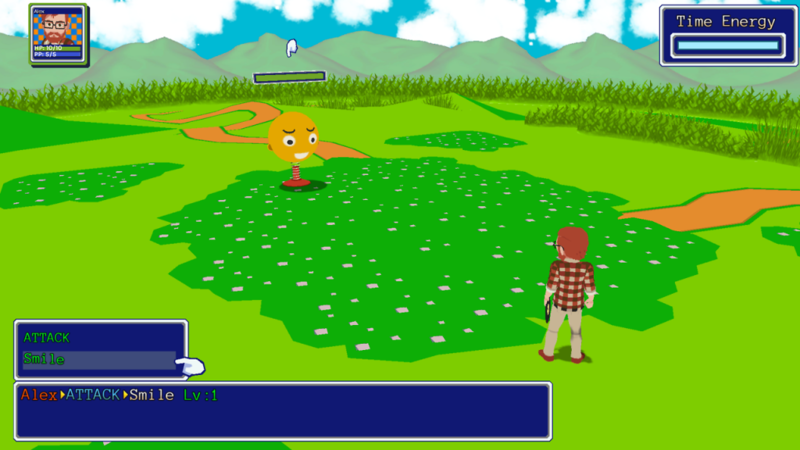 Battles in YIIK are most analogous to Paper Mario, with every action you take coinciding with a microgame to deal damage. The variety in these is pretty great — no two attacks in the game utilize the same design or mechanics, and unlike in PM, hitting action commands is not really an act of routine, but rather focus and concentration, as it requires precise timing, memorization, and accuracy if you want to make the most of each move. Similar actions are taken whenever the enemy uses a move, as you must hit the button press at just the right time if you want to defend or even dodge the attack entirely. Aiding in this is “time energy,” a bar at the top of the screen that fills up whenever you’re hit that allows you to slow down prompts. This creates a delicate balance, as you have to decide when and where to slow down. Do you focus on avoiding hits? Or making the most of your powerful Skills? This forms the basis of the battle system. So what’s the issue? Again, on paper, there’s nothing fundamentally wrong with YIIK’s mechanics — but the devil’s in the details. While each character operates with their own skills and stats, battles feel very unstrategic most of the time — hit the enemies with the hardest attacks, take the least damage, repeat. There’s not much in the way of elemental weaknesses to exploit, or positioning to consider, or any other extra wrinkle that makes you think beyond the best way to attack somebody. 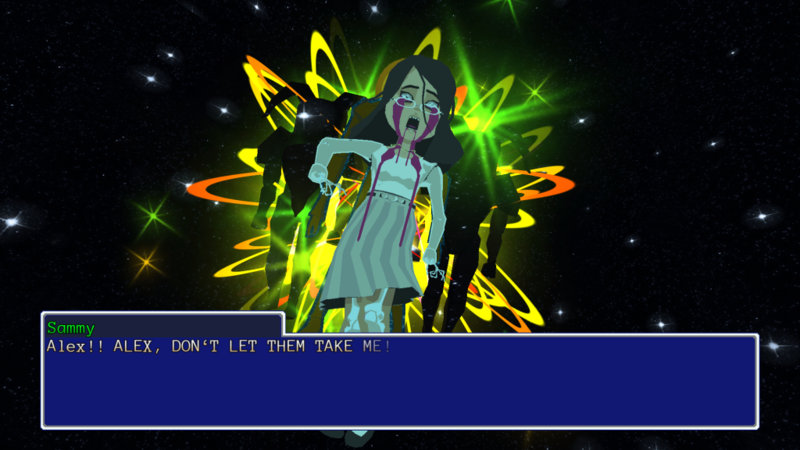 This leaves certain characters just outright better than others, which is disappointing, because some are very interesting conceptually — like Rory, a pacifist with high defenses who can protect other party members, and ends up not very useful because it’s better to have an actual attacker on your side. As a result, it ends up being an RPG more about technical skill than thinking, which is kind of strange. This might not be so bad, except that battles in YIIK often take a long time. Instead of providing more difficult, threatening encounters, most enemies feel like damage sponges that take several rounds longer to kill than they should. The general speed of attacks and actions is also on the draggier end of things. Add in aspects like a low level of enemy variety and the fact that almost every one of their attacks in the game plays out with one of three button prompts ad infinitum, and it grows tedious quite quickly. There are some nuances that help matters — no enemy in the entire game respawns, meaning backtracking is painless — but at certain points generic mobs begin to feel like minibosses. The actual bosses are often fine and actually decently interesting, but as somebody who’s usually not that dismissive of random encounters and the like, I found these to be poorly paced. And it’s not just the battles — the overall pacing of the whole game is elongated. The opening dungeon in particular takes a long time to get through, and while things improve after a while, it never quite settles into a rhythm. Both the town segments of going around and experiencing plot and the battle-focused dungeons feel like they take about 1.5 times as long as they should — a little more intersplicing of the two would’ve helped a lot. It doesn’t help that sometimes the way of progressing can be a little unclear, even with the game’s built-in hint function. At least the dungeons have some solid puzzles and a lot of variety in the environment. But the overall pacing is not very good, especially in the buildup to the climax where it takes a hard turn and suddenly becomes Persona 3, but without (most of) the social sim aspects. Compounding the design woes is the way the game handles level-ups. Experience here is a currency rather than a stat, and you have to spend it in the Mind Dungeon, accessible from any save point. For every 100 EXP, your characters gain a level, with Alex (and only Alex) able to customize his stats in detail. Simple enough. Except the act of going through the Mind Dungeon to choose stats and level-up is again slow, and also largely unneeded in place of the menu. The location does provide some narrative wrinkles, mostly through the soliloquies of a velvet-voiced raven named Marlene, but I can’t help but feel there was a way to both convey that narration and make the level-up system smoother. The aforementioned issues are issues, and they definitely set YIIK back, but they are not the most infuriating aspect of the experience. That would be on the technical side of thing. Now, no game is perfect, and it’s not unusual to encounter a visual hiccup or odd quirk in the programming here or there. It happens, you know? Even a crash or two can be excused. In my playthrough of YIIK, the game never hard crashed. But it did freeze, glitch out, or become otherwise unable to progress in a total of eleven times. Some of those times were in fairly innocuous circumstances. Other times were when I was halfway through one of the game’s dungeons (which may I remind you are quite long). Other times (plural) were during the game’s final boss. And it wasn’t just by poor circumstance, either — I literally broke the game’s scripting by bringing it to 0HP when it was supposed to party wipe me, leaving it undying and just attacking each turn for pittances of damage. I can’t tell you how many times I had to close the game with intense frustration. I think I must have lost around 2 or 3 hours of progress in total. These issues can be patched out, obviously, but the game’s technical issues were so pervasive that I can’t in good confidence dismiss them offhand. And bugs are the saddest issue to criticize, because you know in that instance it doesn’t come down to developer intention, but a lack of time or resources. 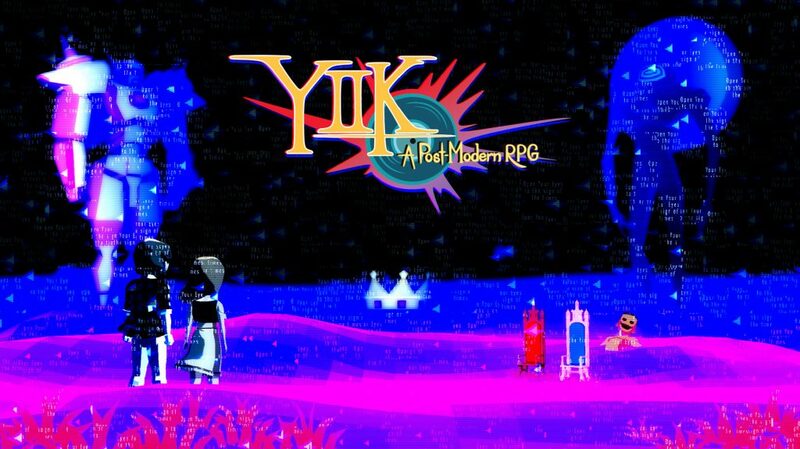 Perhaps it could be construed as laziness, but YIIK — while it is many things — is not a lazy game. It’s one with thought, care, and consideration put into it. I’ve played plenty of games that are soulless, voiceless husks that don’t attempt to do or say anything of value. 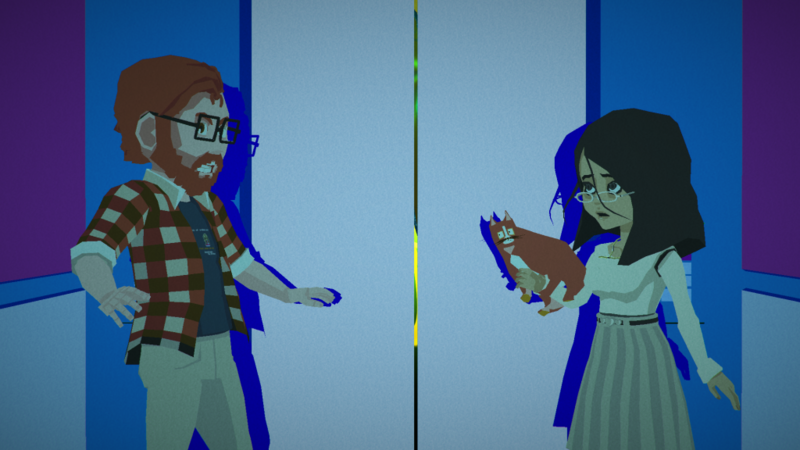 For all its faults YIIK is trying to be something, trying to impart upon its audience an introspective narrative that makes them question who they are as a person and who they could be. 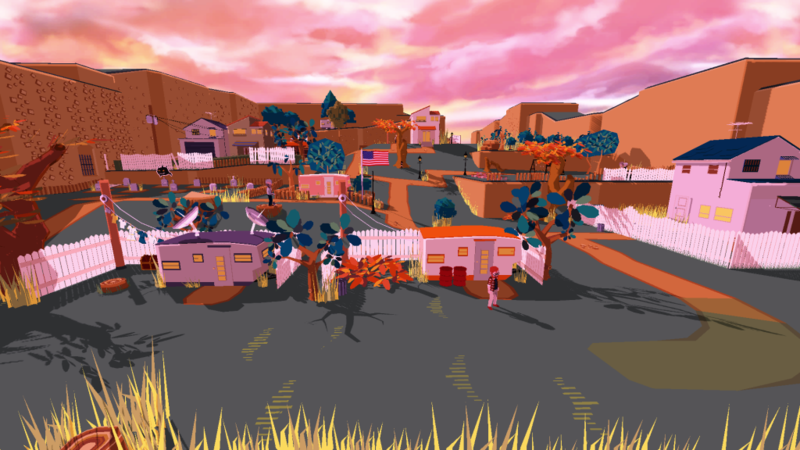 In another reality, YIIK is that game — a stunning, sweeping pièce de résistance that combines that EarthBound-y urban surrealism with a darker and more existentialist vibe to create a bizarre, haunting, and compelling experience. One that eschews convention and modernity to harken back to RPGs of day past and ones that never existed in equal accord, reminding us why the genre was so widespread and beloved in the first place. It would, like any indie classic, show the importance of artistry and creativity over budget and market trends, becoming a game that people come back to year after year in an effort to decipher every metaphor and savor every frame. But we don’t live in that reality. 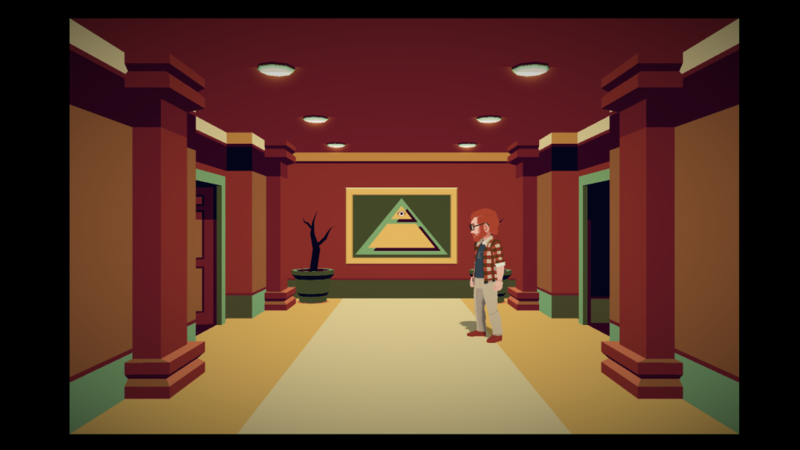 YIIK has some stunning strengths — the VA is impeccable, the audio and visuals in general are quite strong, and I can feel the beating heart of its creators in every pore of the narrative. But its flaws are just as pervasive, making what could — and should — be an impactful experience an elongated slog sprinkled with technical issues that lead to great disappointment. And that makes me sadder than any dull as dishwater by-the-numbers snoozefest ever could.